Here at Cloud 66 there is a lot to measure: from site visitors to signups and temperature outside to the tweets about us. But more importantly we have a ton of metrics that are about our production systems: number of servers running, error rates, cloud provider metrics and server heartbeats. On top of that we display KPIs like MRR as well as London Underground’s realtime line updates for stations near the office. All this needs a good, flexible and configurable dashboard tool. We looked at many strong contenders and finally settled on Dashing an elegant Sinatra based solution by the awesome guys of Shopify . Dashing is a Sinatra app, which it really is. This will instruct Cloud 66 to use a custom web server (in this case dashing instead of Passenger). Now you can check in your project into your favourite git repository and build a stack with it with Cloud 66. 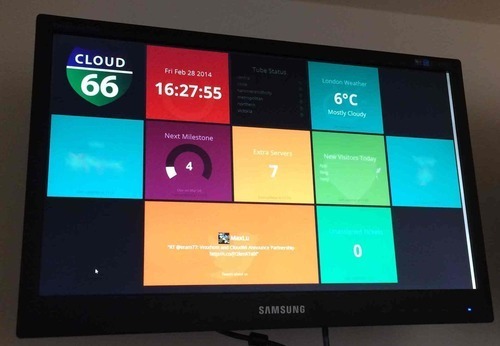 10 minutes later you have your own awesome dashboard up and running. The best part is anyone can just add new widgets to the code, commit to git and it’s live in a minutes.